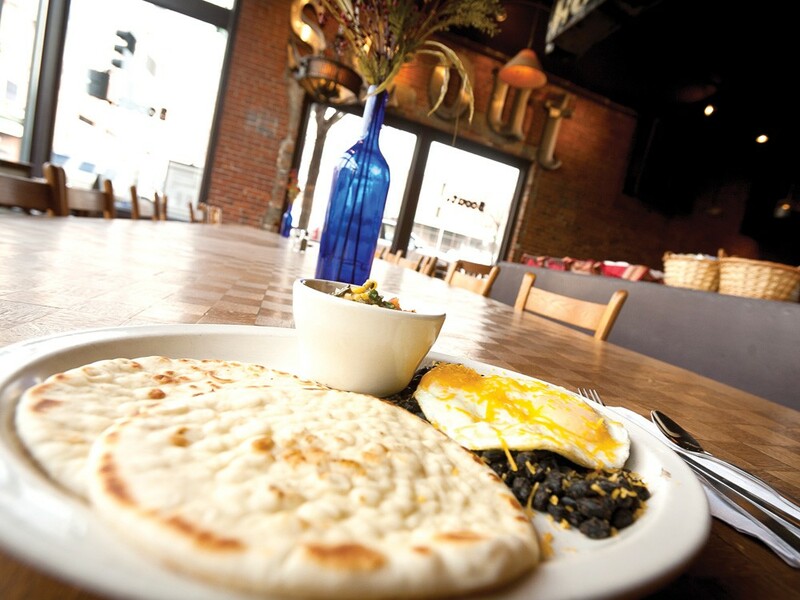 Scout opens in the old Far West location with breakfast. Plus, Phonthip Style Thai on the north side. The British are known for being understated. Portland is known for its quirk. Combine these two characteristics and you get Scout, Spokane’s newest downtown restaurant. Located on the bottom level of the Montvale Hotel, in the space formerly occupied by Far West Billiards, Scout has retained a few of its predecessor’s signature pool tables. The floors have been stripped down to their original wood and the decor comes from around the Northwest. “The old bar back comes from the old Mint Bar that was located in Mullan [Idaho]. The building was taken down in 2002 and I was called to come get it,” owner Rob Brewster says. Scout opens at 7:30 each morning and features a full breakfast menu with drip coffee delivered from the Luxe coffee shop next door. The coffee is served in eclectic mugs — Portland Audubon Society mug, 1984 Olympiad Los Angeles mug — but my breakfast companion’s Bloody Mary ($6) arrived to the table in a glass. The Bloody Mary drinker opted for a plate-sized blueberry pancake ($8) while I went the British pub route and chose the corned beef hash ($12). Vegetarian options include the El Gringo (eggs, black beans, cheddar cheese and corn salsa) or Scout granola ($8). Those looking for something different can sink their knives into the fried chicken and waffle breakfast ($9). Our entrees had surprising depth. Two fried eggs, cooked to order, lay on crisp-edged chunks of freshly peeled Idaho potatoes and quarter-inch thick slabs of corned beef. My dining companion was unable to finish her entire golden, crisp-edged but fluffy-centered, tart and sweet blueberry pancake. She did manage to polish off the Bloody Mary, though. Had we stayed for lunch, we could have eaten soup, salad or chili ($5-$7) or chosen from seven sandwich options, including the Scout burger ($10) or the Fritz Mactarnahan ($10), a sandwich that also goes by the simpler name “Reuben”. Sides range from mac and cheese, fried okra, bratwurst to potato salad ($3-$5). The children’s lunch ($5) arrives in a lunch box and contains PB & J or grilled cheese, apple slices and raisin cookies. "I always wanted to own a restaurant in America, to really show people what Thai food tastes like.” Phonthip Tundkana (pronounced pawn-TEEP) of Phonthip Style Thai smiles bashfully as she reflects on her work. Humble as she is, her restaurant has gained a following amongst local foodies. Originally from Bangkok, Phonthip opened a restaurant 30 years ago, accruing recipes and honing her skills. When her daughter decided she wanted to study abroad in America, she packed up and followed suit. Though destiny brought her to America, she didn’t let the country change her cooking style. From the curries to the Thai tea, everything is made from scratch, the way she learned back home. It’s hard not to fall in love with the place upon entering the building. Attached to a salon on a ridiculously un-navigable intersection, the modest 20-seat space is painted in cheery lime and eggplant; baubles and trinkets bedeck every nook and cranny. After taking our order, Phonthip goes back to the kitchen and gets to work. The Thai tea is noticeably less sweet than that found at most restaurants. Starters include Som Tum (papaya salad, $8), made with matchstick green papaya, carrots, and peanuts, which is sweet and crunchy, with a garlicky kick. There’s always a seasonal special, and the current pumpkin curry ($10) is to die for. Creamy, rich, with chunks of Thai pumpkin cooked to al dente perfection, it is the perfect comfort food for those bone-chilling nights. Spice lovers will enjoy the Pik Khing ($9), whose chili paste leaves a residual heat in the belly. To finish, Phonthip always recommends the mango and sweet sticky rice ($6), for which she has fruit specially shipped in from Thailand. “I’ve had mango from Mexico and other places, but no one has mango as sweet as Thailand’s,” she says.